Please click on image for a full view of stats current to the end of March. 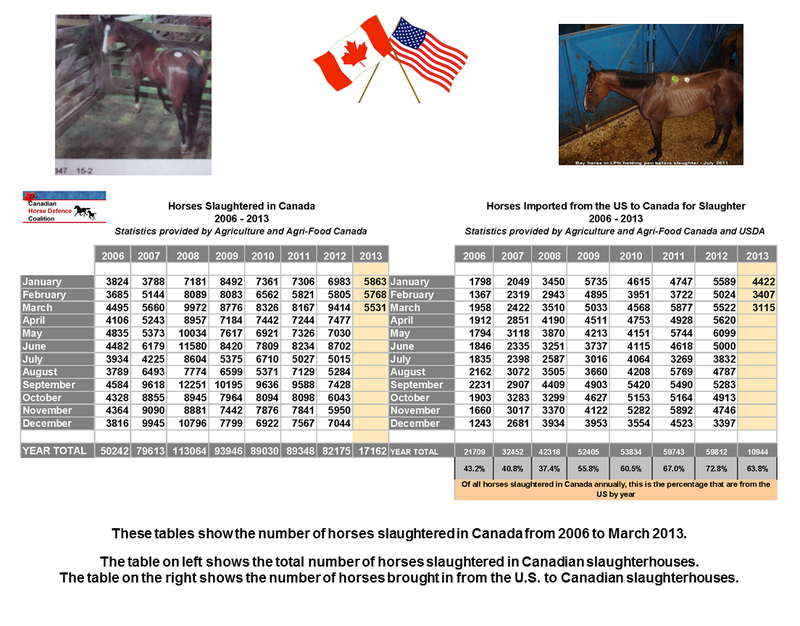 The table on the left shows the total number of horses killed in Canadian slaughterhouses. The right-hand table shows the number of horses brought in from the U.S. for slaughter. Keep in mind, of course, that each number is a life lost. There is no end to lowlife, heartless people (?) who will do anything for money. Obviously they don’t own a mirror or they would be forced to look at theirselves. may the souls of every horse they have murdered haunt them through eternity. The one good thing about the whole rotten business is at least the numbers are down. If the EU would wake up and see that the horses that they will not accept from the U.S. are the same ones being shipped to Canada and then slaughtered and then shipped to the EU there wouldn’t be enough horses available in Canada to keep the dirty business operating. I would think any first grader could figure that out. Numbers are down significantly year over year, and this is before the EU horsemeat scandal really took hold. But still anything more than none is unacceptable. I am also interested in knowing where 2000 plus horses per month (not imported from the US for slaughter) come from in Canada. 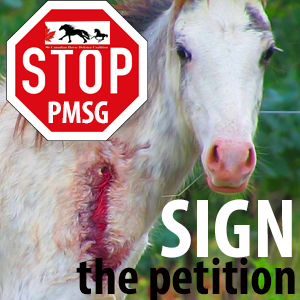 We see the OLEX report and in any given month there are rarely more than 160 to 200 horses. Keep in mind that there are auctions all over the country, maybe not as big as OLEX but they all contribute. At the Sekura Auction that was highlighted in the video “One Horse’s Last Steps”, it was reported that 70 horses went to slaughter from that auction that day alone, so the numbers would add up over the year. Plus the kill buyers troll Craigslist and Kijiji looking for “free to a good home”. For OLEX, have you added up all of the horses since January that went to kill buyers? They total in the area of 600 out of a little over 800 horses in total for the Tuesday auction plus they have the Saturday auction too. And that’s just for six months. There are a lot of horses in Alberta. Lots of cheap pasture in large tracts not just acreages. Calgary Stampede Ranch alone has over 600 head with 100 foals per year. The percentage that qualify as buckers would be very small. I so WISH this would stop finally, I see these pics of perfectly beautiful horses waiting to be tortured, how CRUEL and inhumane WE HUMANS are we KILL & DESTROY everything we touch!!! God gave us all the task of taking care of ALL his animals and he also said to treat all HUMANLY, wonder how he is feeling about us doing such a poor, poor job, this horse slaughter is the most upsetting, disgraceful and CORRUPT business if one can call this a business…. JUST SICK we torture enough animals for our needy pleasures, horses do NOT and should NOT be another one for a few people who like eating it, just terrible……..